I had the pleasure of attending the 8th Annual Body Computing Conference on October 3rd 2014. This was the second year I have attended, and once again it did not disappoint. In one jam-packed day, this conference spearheaded by Dr. Leslie Saxon, Executive Director USC Center For Body Computing, brought together digital health rock stars of innovation from startups to the traditional establishments, investors, academics, athletes, and the general healthcare and technology supply chain. While I could point out a number of interesting new devices, software, APPs and services that were announced at the conference, I’d like to give a brief mention of just one. SingFit is a musical therapy mobile app. It’s actually a bit of a stretch to mention it at all as it uses little to no MEMS technology. 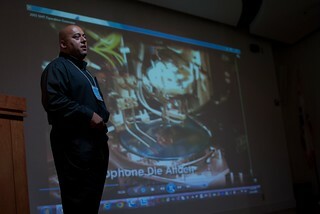 I highlight it though as it won the Body Computing and Skullcandy SLAM contest. The win highlights a growing trend in using music as a way to help patients comply with their therapies. It is also fun and shows great results. Rachel Francine and Andy Tubman developed and created the SingFit app to find new solutions for everything from autism and depression to chronic pain and Parkinson’s disease, by using the world’s oldest medicine, music, in a 21st century fashion. SingFit digitizes the evidence-based music therapy technique of lyric prompting, which enables practically everyone, including those with dementia, autism and traumatic brain injuries to sing on a regular basis in order to achieve therapeutic goals. The videos that Andy showed at the event were truly inspiring. They motivated me to think about what could be done if more MEMS and sensors were used in this way. The Body Computing Conference topics and general industry landscape point to MEMS/sensors being front and center of the mobile health and handheld/wearable device discussion. 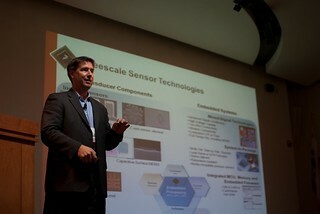 During the conference, various speakers mentioned the current and future use and impact of MEMS/sensors throughout the day. While there have been tremendous advancements in MEMS over the past two decades to meet the demanding needs of high-volume automotive and consumer electronics, we are still in our relative infancy when it comes to small form factor, low-power, low-cost mobile biosensors being applied in wellness and medical applications to deliver an easy-to-use consumer experience. 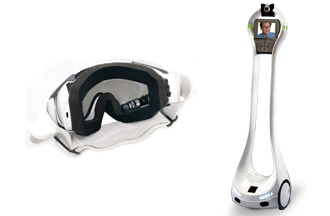 As one analyst and panel discussion pointed out, the future is not wearable…it’s invisible. Is the MEMS/sensor industry capable of delivering on this future anytime soon? When will implantable sensors, skin tattoo sensors and sensor-based clothing actually be a reality for the masses? Lots more work to do here whether you believe it’s upon us already or will happen for the next generation. The ‘more work to do’ aspect has got to involve closer cooperation between the healthcare industry and MEMS/sensor technologists. While Dr. Saxon ‘s work and conference are a bright spot in bringing technological innovation into healthcare settings, and AliveCor is a notable success story here, we are just scratching the surface of the opportunity and the challenges still to come. The good news is that many individuals, companies and industry bodies are coming together to discuss and debate the issues. We need to move quickly to not just observe these challenges but to join and co-create the future of digital health. MEMS Industry Group has formed a healthcare working group to focus on what we can do to better serve not only the needs of our members and industry but to see how we can better serve the needs of the healthcare industry and our co-creation partners there. There will be a panel and topic table session on this at the upcoming MEMS Executive Congress US 2014, November 5-7, Scottsdale, AZ. Come sing, dance and co-create with us! Two weeks ago, MIG had a wonderful time at SEMICON West, participating in a variety of constructive and gratifying industry-focused networking opportunities. 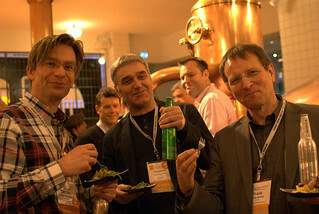 The Jam-packed event saw both MIG and its members engage in everything from demonstrations to cocktail receptions. Over 30 member companies exhibited on the show floor, showing off their latest in equipment, materials, packaging solutions, design automation tools, foundry services, product development and R&D, while still more members busied themselves with private appointments off of the show floor. MIG welcomed increased traffic at our booth, showing just how relevant MEMS has become, while reinforcing why an industry association is the key to connecting to partners to increase business opportunities. The MIG team enthusiastically spoke about the benefits of joining MEMS Industry Group while promoting our members to interested individuals. 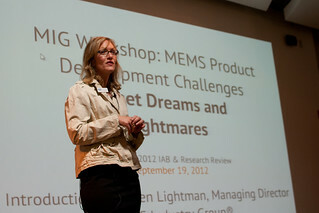 SEMI hosted their traditional MEMS content entitled, “Next Generation MEMS”, on Tuesday, July 8th. This content featured all MIG member and partner companies, including Yole Développement, Qulacomm, Silex Microsystems, GE Global Research, Si-Ware, SolMateS, NIST and EV Group. Shared content emphasized new challenges and opportunities for the MEMS supply chain to meet the needs of the expanding range of mobile devices, wearables and smart objects in the Internet of Things. MIG also hosted its increasingly-popular cocktail party at Restaurant Lulu on Wednesday night, July 9th. With over 300 people in attendance, it was THE place to be for MIG members to meet and network. MIG would like to thank our Platinum Sponsor Plan Optik and Bronze Sponsors C2MI, Expertech and Oxford Instruments for making SEMICON West and the cocktail party possible. If you want to relive the memories or are curious about what you missed, be sure to check out photos from the event. I last left you hanging, waiting to hear more about the heated conversations between the panelists and the audience – and I have to tell you, it really started heating up in the audience during the energy panel. Ooo baby it was jumping. MEMS in energy can mean a lot of things – and our panelists diverse perspectives discussed a great deal, but the majority of the audience wanted to focus on the topic of MEMS in energy harvesting. Though not necessarily experts in this field, thankfully our panelists were up to the challenge. 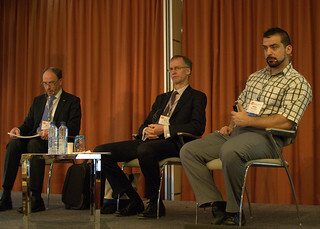 Our moderator was Bert Gyselinckx, General Manager, Holst Centre, imec; Wim C. Sinke, Program Development Manager, Solar Energy, Energy Research Centre of the Netherlands; Eric Yeatman, Professor of Microengineering, Deputy Head of Department, Imperial College London; and Harry Zervos, Senior Technology Analyst, IDTechEx. I actually should probably add Rob Andosca of MicroGen Systems as a fifth panelist as he was eager to ask and answer any question from the audience with his BOLT energy harvester in hand. I loved the diversity of perspective on this panel –Wim for example does not have an entirely MEMS-centric background. His expertise is in solar and photovoltaic energy and he spoke of how multiple technologies will work together to make reliable and sustainable energy system, as well as the importance of portfolio management – combining different energies in an active way to make it work. We in MEMS could learn a lot from guys like Wim (I hope everyone picked up his business card; I know I did). The panel also spoke about wireless sensor networks and Harry gave a great overview of the three technologies that are converging: 1. Microgenerators and energy storage (vibration, solar, heat, tree resin, etc. ); 2. Ultra low-power electronics (currently being developed) – helping power sensors; and 3. Transmission protocols that don’t need a lot of power to send data. Eric followed up with the poignant view that until things become truly wireless, you can’t really have wireless sensor networks. And once they are wireless how will they be powered – by energy harvesting or battery? This opened the floodgates and I, with microphone in hand had to jog all over the audience to capture the comments and follow-up questions from the audience. Let me be diplomatic and say that there is no clear consensus out there on MEMS energy harvesting. And out came the very clever quotes including some of my favorites including this one from Wim: “Don’t look at MEMS as the energy harvesters, MEMS are the enablers to help realize energy savings.” And this one from someone (maybe you’ll remember and leave a comment here) “I’m happy to hear everyone in MEMS talking about energy, but I can assure you that not everyone in energy is talking about MEMS…yet.” And Bert’s: “MEMS will probably not be main source of energy replacing nuclear power plants soon; but MEMS will enable increased intelligence in energy applications.” As great as these sound bytes were, the show stealer came when Rob Andosca stood up and talked about how cows are being used for energy harvesting and gave us the best quote: “You power the Moo-mometer with MEMS because cows get dirty.” Tech-Eye reporter Tamlin Magee loved that one too and plans to write a story on – perhaps cow-power is the next big thing! The last panel of the day before the closing keynote was MEMS in medical with a focus on aging moderated by Frank Bartels, Founder (Bartels Mikrotechnik), President (IVAM). 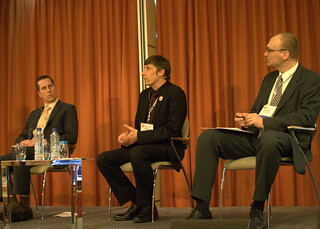 Panelists were: Heribert Baldus, Principal Scientist – Personal Health Solutions, Philips Research; Jérémie Bouchaud, Senior Principal Analyst, MEMS and Sensors, IHS iSuppli; Kimmo Saarela, CEO, TreLab Oy; and Axel Sigmund, National Contact Point MTI/DW and Ambient Assisted Living Joint Programme, VDI/VDE Innovation + Technik GmbH. This was another diverse panel with varying views on how to address the medical and healthcare issues of the world’s aging population. When asked how MEMS is enabling a better quality of life with regard to prevention, monitoring, management, replacement and rehab I think Kimmo summed it up best when he said that with MEMS we can put so many things into a small form factor, which entices people to use our products. MEMS sensors allow us to collect raw data from so many sources. Data analysis is the key benefit and is their “value add” to the customer. But the key thing here is that power consumption and size really matter. 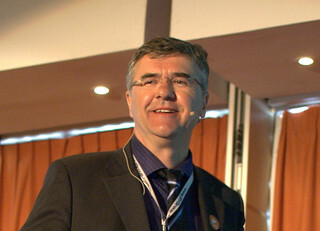 Heribert added that MEMS is enabling an aging population to detect issues in their daily lives and manage their lives. I like to say it gives them their dignity back – and that is no trivial thing. Jérémie spoke of some of the mass markets already present for MEMS in aging including sleep apnea disorders and oxygen therapy. There are also mass markets for MEMS medical applications that are in the hospital (not yet in the home) including disposable blood pressure monitors as well as dialysis and drug infusion applications. This kicked off a discussion about an aging population living at home which is becoming more of a critical issue in Europe, and a main focus of what Axel is addressing at VDI/VDE Innovation + Technik. At the close, the panelists were asked what they saw as the future of medical – Heribert said he’d like to see more sensor integration, more intelligence and far less power. Jérémie said he sees a future for gas sensors analyzing the breath (and will not require FDA approval). Axel sees non-invasive diabetes monitoring as having the biggest impact; while Kimmo echoed Heribert and sees a future of more integrated solutions where biometric sensors will give more data and aid early detection and intervention. Frank agreed with Jérémie that gas sensors will be next once the pump issue is solved and that the time for microfluidics is near. the next generation of medical devices will come from miniaturization of devices, reduction of power consumption, and wireless capability and yes, even spoke of energy harvesting (you can guess whose ears perked at that statement). Renzo then highlighted how the BioMEMS market is expected to grow from $1.9 B in 2012 to $6.6 B in 2018 thanks to the inclusion of accelerometers in pacemakers and homecare monitors; MEMS sensors for glucose meter connected to smartphones; MEMS microphones for hearing aids as well as MEMS insulin pumps. The audience was excited to discuss where Renzo saw the future of BioMEMS going, and where he felt the industry should focus moving forward. Renzo agreed that in the near future (once regulatory hurdles were overcome) patients will be able to monitor their implantable devices on their mobile devices. And he felt the next big thing will be biomarkers, as well as MEMS-enabled devices that could give an ECG will be revolutionary to the medical field. And with that it was time to break and enjoy a fantastic evening at the Heineken Experience. We took some photographs throughout the day but by far my favorites are the ones we took at the brewery – you should definitely check them out. I would like to close this mega-long blog by thanking everyone who made this second-year MEMS Executive Congress Europe a great success from my fabulous MIG Team, to the MIG Governing Council, to the Congress EU Steering Committee, to the AMAZING sponsors (especially those top tier ones who are sponsoring all year long – we love you), the keynotes, the speakers, the attendees (especially the press who attended and those who have posted great stories – hooray! ), our fantastic conference organizers at PMMI, and our sister conference folks at Smart Systems Integration. THANK YOU ALL.